A month ago, I was asked by La Morena to make a recipe that celebrated the flavor of Mexico by using authentic Mexican products. We love Mexican inspired recipes, so I was so excited for the opportunity. It was fun creating my own recipe – the Cheesy Corn and Jalapeño Dip that you see below – but it was also fun getting to see the other recipes created, too. There are so many must-try recipes from my fellow bloggers that you will definitely want to check out. When I was contacted about a fun new party on social media celebrating La Morena and their authentic ingredients, I had to say yes!! Whether Mexican recipes are a part of your heritage or just something you love, join us for the #VivaLaMorena Pinterest Party this coming Saturday! We’ll be celebrating the flavors of Mexican meals, and sharing awesome recipes that are made better with quality, authentic Mexican products like La Morena! To add a fun twist and thank all the party goers, we’ll let you in on a not so little secret – a $1000 secret, in fact! When you join the party and chat with us on Saturday, November 15th at 12pm ET, we’ll announce the #VivaLaMorena Sweepstakes that includes a $1000 pre-paid Visa card grand prize! How awesome is that right before the holidays!! You won’t want to miss the unveiling of the secret code during the chat for entry into the sweepstakes. Find something you’d love to try and save it by Re-Pinning to your Boards! Watch for the Secret Code which will only be available during the party! Can’t wait to join in the fun? Then take a look a the Sneak Peek of the Pinterest board for the party by clicking on the image below. Hope to see you Saturday!! Feel free to ask me any questions you might have! That sounds like a party worth attending. I’ve never actually been to a Pinterest party before. How fun! I’ve never been to a pinterest party before! Now that is a party that’s gonna start my tummy growling It sounds fun! That sounds like my kind of party for sure! Drooling already! Oh fun! I’ve never done a twitter party before – but it sure does sound fun! This is actually something new – a Pinterest party. We will be interacting on a Pinterest board: http://www.pinterest.com/SoFabChats/vivalamorena-recipe-party/. Hope you can make it and get the secret to possibly winning $1000. I love finding new recipes. Sounds amazing! This looks like a fun party! I love parties like this. That’s a pretty great prize you’ll be announcing. And the party does sound fun. What a great idea! This looks like a lot of fun! Thanks for the info. I’m definitely up for checking out all the recipes with La Morena Chipotle Peppers. I know they’ll be super flavorful and my family loves a little heat in our food! Great Twitter party. I write myself a note to jump in! I love La Morena’s products! They have such amazing flavor. This is actually something new though – a Pinterest party; NOT a Twitter Party. I wouldn’t want you to go looking in the wrong place Saturday. We will be interacting on this Pinterest board: http://www.pinterest.com/SoFabChats/vivalamorena-recipe-party/. Hope you can make it and get the secret to possibly winning $1000. I love using the La Morena Chipotle Peppers. I have to try your recipe. That sounds like an amazing recipe, I’d love to try it! The Twitter party sounds fun! Wish I could join in. This is actually something new – a Pinterest party; NOT a Twitter party. 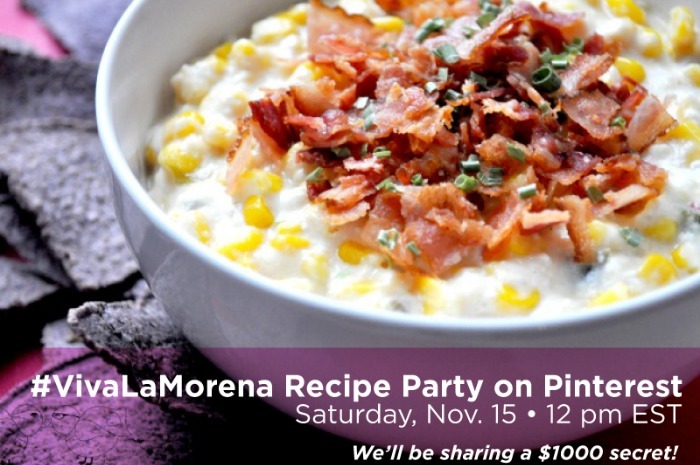 We will be interacting on this Pinterest board on Saturday: http://www.pinterest.com/SoFabChats/vivalamorena-recipe-party/. Hope you can make it and get the secret to possibly winning $1000. I’ve never been to a pinterest party. It looks like a lot of fun. And your dip looks great. This is something completely new that we are trying! If you can, hop on over to this board on Saturday to make comments on the pins and answer our questions! http://www.pinterest.com/SoFabChats/vivalamorena-recipe-party/. Hope you can make it and get the secret to possibly winning $1000.